Improve your guest experience from the inside out. When most hotels and resorts think about where to spend their money, they’re usually thinking of one thing – improving the guest experience. While guests demand more unique activities and personalized service, hotels must find a way to handle all the supplies – and employees – that make those experiences possible. It can be tempting to forego storage space for guest features up front, but an accessible, organized back-of-house storage solution impacts guests more than new sofas in the lobby. When items are easily accessible, employees spend less time searching and fulfilling requests and more time focusing on and interacting with guests. 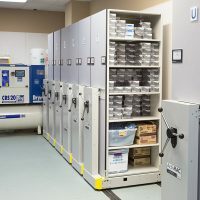 The right storage solution allows you to store up to 50% more in the same space, meaning more space to store the supplies you need to enhance the guest experience or more space for new guest activities and revenue streams. 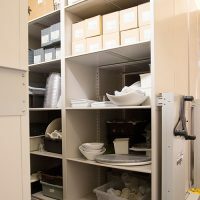 Staff can almost instantly retrieve necessary items — even large and heavy items like tables – without the need to move other fragile or heavy items to get to what they need. 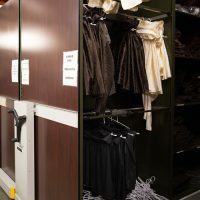 At Tulalip Resort Casino, an improved back-of-house storage solution using ActivRAC mobile storage helped them improve the guest experience and make employees’ jobs easier. 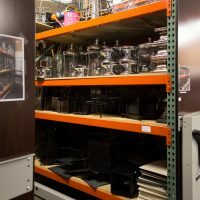 Shelves or heavy duty racking are mounted onto rails in the floor, allowing shelves to slide together and eliminate wasted aisle space. 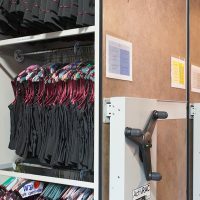 Aisles are accessed easily with a mechanical assist handle or button. Learn more about ActiveRAC® heavy duty mobile storage. 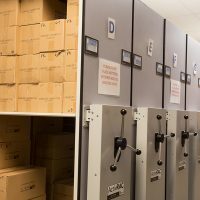 Hear tips from a resort and casino general manager on how they tackled “heart-of-house” storage. 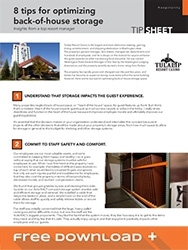 Download a copy of the 8 Tips for Optimizing Back-of-house Storage.